Between 1957 and 1962, the UK and USA tested 33 nuclear devices at Malden and Kiritimati (Christmas) Islands, now part of the Republic of Kiribati. British, Fijian, New Zealand and American veterans of the testing program and I-Kiribati civilians who lived on Kiritimati claim their health (as well as their descendants’) was adversely affected by exposure to ionizing radiation. Their concerns are supported by independent medical research. However, analysis of the ongoing humanitarian, human rights and environmental impact of nuclear weapons testing at Kiritimati and Malden Islands has been inadequate. Though the UK government assured coverage of Fijian troops’ service-related health problems during the tests, it has offered them no assistance or compensation. Instead, the Fiji government has stepped in to offer a one-off grant to veterans to support medical and welfare costs in 2015. 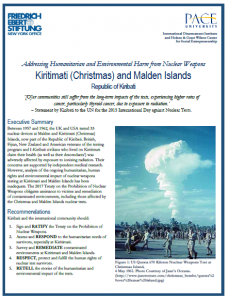 The following documents offer information on the humanitarian, human rights and environmental impact of nuclear weapons testing in the Republic of Kiribati. For our own report on Kiribati, click here. For our report on Fiji, click here. Fiji was also included in New Zealand’s fallout monitoring system, which detected stratospheric fallout at monitoring stations in Nadi and Suva. Total 33 tests (9 UK and 24 USA) on Kiritimati and Malden Islands. 43,000 personnel participated in the UK and US nuclear weapons tests in and around Kiribati (276 from Fiji); family members and dignitaries also visited. Fijian soldiers and sailors were often allocated more dangerous tasks, like dumping birds killed or blinded by the tests, and even radioactive waste, into the ocean. The 500 I-Kiribati civilians living on Kiritimati during the tests received little protection. There are at least 48 first generation survivors in Kiribati, plus 800 children and grandchildren of survivors. Many military and civilian survivors have health problems consistent with exposure to radiation; descendants also report multi-generational health problems. Fiji also received fallout from French nuclear testing in the Pacific. Makurita Baaro. (2015) “Statement in informal meeting to mark 2015 Observance of the International Day against Nuclear Tests.” External link. John Baron. (2008) “British Nuclear Test Veterans.”Hansard. External link. Comprehensive Test Ban Treaty Organization (CTBTO). (n.d.) “8 November 1957 – Grapple X.” External link. Defense Nuclear Agency. (1983) Operation Dominic I 1962: United States Atmospheric Nuclear Weapons Tests: Nuclear Test Personnel Review. Washington DC, DoD. Download. Fiji. (6 September 2018) “Statement by H.E. Dr. Satyendra Prasad, Permanent Representative of Fiji to the United Nations at the High-Level Meeting of the General Assembly to Commemorate and Promote the International Day Against Nuclear Tests.” Download. A.C. McEwan, K.M. Matthews & L.P. Gregory. (1981) An Environmental Radiation Survey of Christmas Island, Kiribati. NRL Report 1981/9. Christchurch, New Zealand National Radiation Laboratory. Download. Rebecca Miles, et al. (2011) British Nuclear Test Veterans Health Needs Audit Commissioned by the UK Ministry of Defence. Miles and Green Associates. External link. War Pensions and Armed Forces Compensation Chamber. (December 2016) Decision: Ministry of Defence vs. Abdale et al. Download. Other documents related to this case available from this external link. Lorna Arnold. (2001) Britain and the H-Bomb. London, Palgrave Macmillan. Christopher Busby and Mireille Escande de Messieres. (2014) ‘Miscarriages and Congenital Conditions in Offspring of Veterans of the British Nuclear Atmospheric Test Programme.’ Epidemiology. 4(4). External link. Rebekah Leigh Johnson. (2009) “Psychological Fallout”: The Effects of Nuclear Radiation Exposure.” Doctor of Clinical Psychology thesis, Massey University. External link. Sue Rabbitt Roff. (1999) “Mortality and morbidity of members of the British Nuclear Tests Veterans Association and the New Zealand Nuclear Tests Veterans Association and their families.” Medicine, conflict and survival. 15(Suppl. 1). pp. i-ix, 1-51. External link. Monty Sherwood. (2011) “Nuclear Testing in Kiribati: Global, Individual and Environmental Consequences.” SEA Semester. External link. Catherine Trundle. (2011) “Searching for Culpability in the Archives: Commonwealth Nuclear Test Veterans’ Claims for Compensation.” History and Anthropology. 22(4). pp. 497-512. External link. M.A. Wahab et al. (2008) “Elevated chromosome translocation frequencies in New Zealand test veterans.” Cytogenetic and Genome Research. 12(2). pp. 79-87. External link. International Physicians for the Prevention of Nuclear War (IPPNW). (n.d.) “Kiritimati and Malden, Kiribati.” Hibakusha Worldwide. External link. Losean Tubanavau-Salaluba, et al. (Eds). (1999) Kirisimasi: Na sotia kei na lewe ni mataivalu e wai ni viti e na vakatovotovo iyaragi nei peritania mai Kirisimasi. Suva, Pacific Concerns Resource Centre. C.A. Smith. (2015) “Operation Dominic JTF 8 1962.” NAAV News. p. 9. External link. BBC. (2007) ‘Christmas Island H-bomb controversy.’ BBC Inside Out. External link. BBC. (2017) Britain’s Nuclear Bomb: The Inside Story. External link. Matthew Bolton (2018) “The Devastating Legacy of British and American Nuclear Testing at Kiritimati (Christmas) and Malden Islands.” Just Security. Link. Susan Boniface. (2018) “The Proof that British Nuclear Test Crews Were Used as Human Guinea Pigs by their Own Government. Daily Mirror. External link. Channel 4. (1991) “The Truth of Christmas Island.” Dispatches. External Link. Rob Edwards. (2006) “300 Islanders Accuse UK Government of Exposing Them to A-bomb Fallout.” Sunday Herald. External link. Radio New Zealand. (2018) “Call for help for Pacific’s neglected nuclear test victims.” Link.